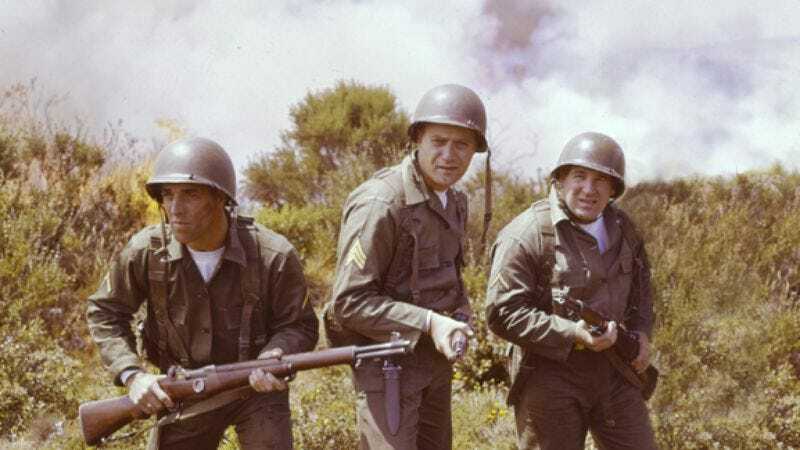 In 1962, ABC-TV decided to re-fight World War II, via two new series: The Gallant Men, which followed a ragtag bunch of American soldiers slugging their way through Italy, and Combat!, which traced the Allied march across France. But while The Gallant Men delivered an impressive pilot episode, the show only lasted one season, perhaps because Combat! swiped the man responsible for such a strong start: director Robert Altman. Combat! ran five seasons, and in its later years, it told stories of full-squad battles and firefights set during an unspecified time on the European front. But the first season remained fairly continuous and specific, beginning with D-Day and ending with the imminent liberation of Paris. Each episode carved the war up into small crises, usually with one or two U.S. soldiers and a handful of Germans locked in a moment of stalemate. Before that first year was up, both Altman and Blees had been fired, but they set a tone and established a style that carried on throughout the series, even when the action shaded toward the generic. Accounts differ on exactly when and why Altman and Blees got the axe, but it surely didn’t help that Altman waited until his bosses were out of town and then pulled a script off the shelf that they’d all ordered him not to shoot—a script with minimal story, and that the executive producers had told Altman was “too relentless, too grim.” To be fair, that episode, “Survival,” is everything the Combat! producers feared. But it also turned out to be a stellar, critically acclaimed hour of television, which earned its star Vic Morrow an Emmy nomination. “Survival” opens with our heroes holed up in a French farmhouse, surrounded by Germans and on the brink of capture. They smash up their guns so the enemy won’t be able to use them, then surrender and get tethered to a German tank and taken behind enemy lines, where the Nazis shackle them in a barn. Just as one German starts sizing up the prisoners to see whose boots he can steal, the makeshift jail is shelled, and all the Americans escape save for Morrow’s Sgt. Saunders. The rest of the episode follows Saunders and his comrades’ separate efforts to get to safety. While the squad races away from the enemy stronghold, Saunders stumbles out of the barn, shell-shocked and with barbecued hands. While his mates deal with missing boots and a lack of weapons, Saunders writhes in pain and looks for cool water and mud to soothe his burns. Note how long Altman lingers on Vic Morrow’s face here, lingering on the sensuality of the moment. Eventually, the squad is able to raid an enemy camp for rations and guns, though a grab for boots costs one soldier his life. On the episode’s DVD commentary track, Altman says that he and Blees always tried to cast actors in multiple episodes before killing them off, so the audience wouldn’t automatically assume that any new face would be dead by the end of the hour. The death here is a shock, because the character Kelly had been featured prominently in two earlier Combat!s, and also because it happens so fast that Kelly’s mates have to leave him and flee. It’s an unsentimental, unheroic scene. …while Saunders, who shows up later, can’t grab anything with his charred arms, so he sits and contemplates what he can’t have. The dissolve from a frustrated Saunders to a stymied Saunders has an impressionistic feel, like something out the European art films of the early ’60s. …Saunders rolls in with the dead German in his arms, convinced that the dead man is his brother, and that he’s responsible for his death. In the last shot of the episode, men from one of the tanks (including one played by Michael Murphy, who went on to be an Altman regular) drag the incoherent Saunders to the side of the road so that their brigade can continue. Right before the fade-out, we see some unidentified American troops on foot, blithely munching apples. From time to time—including lately—cultural commentators argue that TV has surpassed movies, and that the best of the box is better than anything at the multiplex. Me, I hesitate, even though I’ve made similar arguments in the past. Television is good at character and plot development, but very rarely does it make art out of images, the way the best cinema can. Even during what’s widely regarded as television’s “golden age,” the best shows had more in common with theater than movies; whenever directors with a strong visual sense emerged (like John Frankenheimer), their skill manifested primarily in the clever blocking of actors and camera moves, and how they worked around the limitations of a soundstage and a live broadcast. By the late ’50s, Hollywood had begun playing catch-up with TV by embracing more mature, socially relevant subject matter, occasionally with scripts that originated on television. But a lot of those films now come off as forced, even remedial, especially when contrasted with the movies coming out of Europe at the time. The best cinema of the late ’50s was far more sophisticated visually, and worldly enough that it didn’t need to trumpet its “importance.” By the early ’60s, TV started to develop some of that visual panache. Then in the ’70s, thanks in part to Norman Lear, TV took a step backward as a visual medium. But for about 10 years, the art form took the “art” part seriously, as everything from cop shows to sitcoms embraced mise-en-scene, montage, location shoots, and lyricism. What exactly did Robert Altman do during this time that had TV execs and producers raving about him, at least until they inevitably canned him? Altman used to say that his major contribution was the moving camera. He contended that because TV and movie screens are flat and boxy, the only way to create the illusion of depth is to move the camera around a set, to make audiences grasp that the world keeps extending beyond the immediate frame. On Combat! in particular, Altman believed in letting the images and the actor tell the story as much as possible, and he was already in the habit of ditching large chunks of scripts and letting the spirit of the day dictate what he would shoot. Like Alfred Hitchcock, whom he’d worked for a few years earlier, Altman also preferred to shoot with as little coverage as possible, so that the editors were forced to put the puzzle together the way he meant them to. That approach likely salvaged “Survival,” which was completed after Altman was fired. On the commentary track, Altman claims that he sat in a bar across from the MGM lot while Vic Morrow came in periodically with updates on how the editing of “Survival” was going, and left with Altman’s suggestions on how to proceed. That feeling of camaraderie with actors—bordering on conspiracy—remained a hallmark of Altman productions. It started with Dan Blocker on Bonanza; Altman was drawn to the hulking galoot and would often find ways to give Blocker more to do on the episodes he directed. Combat! had a fine cast of regulars (and featured vivid guest turns by the likes of Tab Hunter, Tom Skerritt, Harry Dean Stanton, and Robert Culp), but Altman liked Morrow best, and used the actor’s unsteady gait and quick temper to embody the sometimes-untenable contradictions of a show that tried to praise courage under fire while decrying the fire. Morrow takes some big chances in “Survival,” playing moments so pained and blubbery that they border on the laughable. But they’re never unbelievable. Watch Saunders holding his scorched limbs away from his body, and it’s easy to imagine the excruciating pain of every slight touch or gust of wind. That openness to input helped shape Combat!’s realism. Since Pirosh, Blees, and Altman had all served in the military, Combat! excelled at micro-moments, noting how soldiers would slip purification tablets into their canteens, how German snipers might get distracted by a hungry kitten, and how a swim to safety could be hampered by a floating corpse. Note the scene in “Survival” where Kelly gets shot, and how the Nazi takes a beat to hold a flashlight against his rifle before he aims and shoots. That kind of authenticity sold the show. I remember talking to one of my high-school friends about a year after he’d moved to Los Angeles to become an actor, and he described a similar feeling of being adrift. He’d go out on auditions—and even jobs—and wouldn’t know what was expected of him, or when he’d have any money coming in. I’d imagine that’s been the case for actors for about as long as the profession has been in existence. Now imagine that into that atmosphere of uncertainty, in walks a guy like Robert Altman, who tells you you’re amazing and urges you to share your ideas. You’d probably follow that man anywhere he led you—even if it turned out later that he had no authorization. Note: Quotes from and about Altman drawn from Mitchel Zuckoff’s Robert Altman: The Oral Biography, Patrick McGilligan’s Robert Altman: Jumping Off The Cliff, and commentary tracks on the Combat! DVD sets.